Everyone needs a good exfoliator to keep their skin in tip top condition but it can often be hard to find one you really like because they vary so much. The term ‘scrub’ can often mean the product has a abrasive material in it that will work as a good exfoliator to remove dead skin cells or simply contain some sort of beads which don’t actually seem to do very much. I tend to feel the latter fall into the ‘body wash’ or ‘facial wash’ category more than they do a scrub but you can’t tell what a product lwill be like unless you read reviews or try it for yourself. There are a few scrubs in my collection I love because they are not too harsh on my sensitive skin but at the same time work really well at exfoliating and smoothing. I particularly like the Laura Mercier Ambre Vanille scrub because it smells incredible, just like the Souffle, heaven! I’m also a fan of Soap and Glory Flake Away for the same reasons as well as Soap and Glory Sugar Crush although I’m not keen on the scent of that one as I’m not a big fan of citrus. 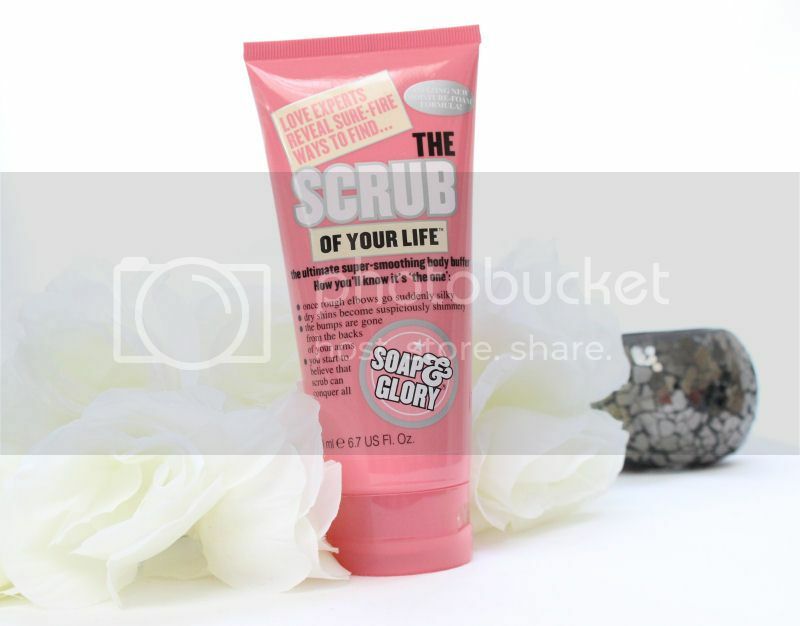 I got Soap and Glory Scrub of Life in a gift set my boyfriend bought me for Christmas and seeings as I’m a fan of two of the other exfoliators they have on offer I was intrigued to see how it would compare. Firstly, looking at the packaging I definitely prefer it. Using a squeezy tube to dispense the product is much more hygenic and practical because if you are using it in the shower the water doesn’t get mixed in with the product and turn it into a gloopy mess which I find often happens when using a tub. 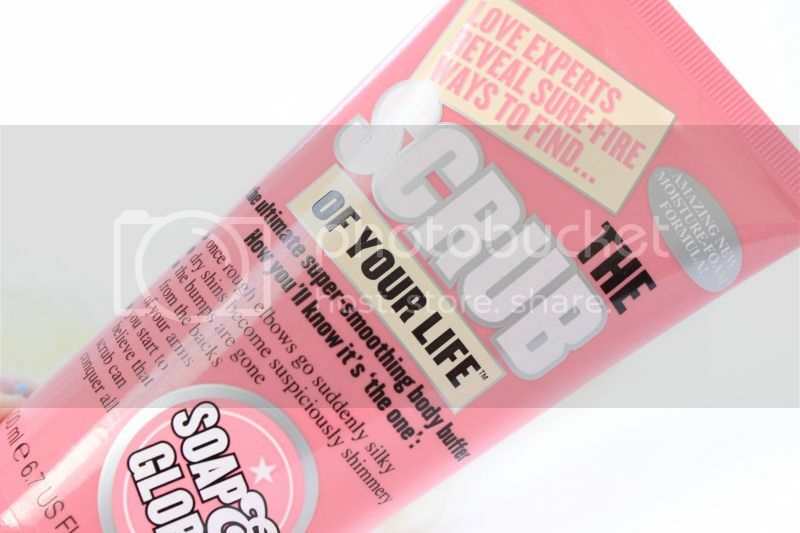 The formula of Scrub of Your Life doesn’t seem as grainy as Flake Away or Sugar Crush at first but when you rub it onto the skin you can feel the beads exfoliating and doing their job. This product also lathers up really nicely at the same time so it is like using a scrub and wash in one which is really nice. It makes the product a lot easier to apply and really makes me wish they had a version of this to use on the face too because it would be perfect! After using this Soap and Glory product my skin is left silky smooth and not irritated in the slightest. Priced at £7.00 for a 200ml bottle Scrub of Your Life is definitely worth every penny! What is your favourite face and body exfoliator? 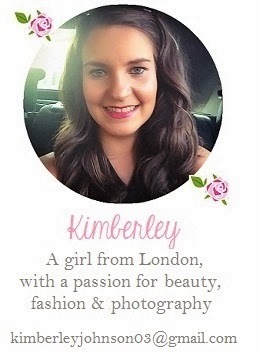 I've nominated you for the very inspiring blogger award! Looks like a great scrub! I'm usually a fan of the Sugar Crush scrub, but I also LOVE this product! It has a different scent and I love the way it makes your skin feel afterwards..silky smooth. This is my fave product for exfoliating. It smells amazing and makes my skin feel lovely! This product is seriously AMAZING! By far the best affordable scrub EVER!!! Visit www.iwalkinfashion.com to enter my giveaway! goodluck!